Do you want a straight, beautiful smile but feel nervous about committing to braces? At Dr. Latner’s Los Angeles dental office, we offer a clear alternative to traditional braces that’s helping patients everywhere achieve exactly what they’re looking for. It’s called Invisalign, and with it we’re helping busy professionals improve their confidence, their oral health, and their overall quality of life. How Does A Straighter Smile Improve Oral Health? You already knew a straighter smile can result in greater self-confidence, but you might be wondering how a straighter smile can also improve oral health and overall wellbeing. When teeth aren’t spaced right or are misaligned, they’re more vulnerable to common oral health problems like tooth decay and gum disease. What’s more, misalignment can also cause neuromuscular problems. But Invisalign can help. Using a series of clear, acrylic aligners, Invisalign will bring your teeth into their ideal alignment, offering them extra protection from each of these. Improved oral health is just one benefit of using Invisalign, though. Don’t forget about that first one we mentioned—improved confidence. If you’ve ever been afraid to smile in front of friends or family, Dr. Latner and his Los Angeles team can help. 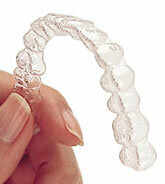 Another benefit of Invisalign is that it’s more comfortable. Dr. Latner will use 3D computer imaging to design your treatment, ensuring that it’s as precise and comfortable as possible. Want to Learn More About Invisalign? If you’d like to know whether Invisalign is right for you, Dr. Latner can help you decide. Call our Los Angeles dental office today to schedule your consultation appointment. You can also visit our Invisalign page to learn more. by: Les Latner at August 15, 2012 .